Clouds and some sun this morning with more clouds for this afternoon. High 56F. Winds SSE at 10 to 15 mph..
“Disney’s Beauty and the Beast” had eight public performances plus 12 weekday performances for schools in December 2013, thanks to a grant from SC Johnson. RACINE — The Racine Theatre Guild received a $22,000 grant from SC Johnson to support theater programming for children and families in southeastern Wisconsin. Specifically, the grant sponsors season 81 of the Racine Children’s Theatre and two main-stage productions, “Disney’s Beauty and the Beast” and “The Miracle Worker,” in the Theatre Guild’s 76th season. Every year, from fall through spring, the Children’s Theatre offers four fun productions for kids and their families. Completing the season in 2014 are “The Magical Land of Oz” (February 7-9) and “Cowboy Camp” (March 21-23). Each production provides a complete, interactive experience, beginning with a newsletter mailed in advance. On show day, Packy, the RCT’s popular elephant mascot, greets children and introduces a play. Following the performance, the costumed characters form a receiving line, sign autographs and pose for photos. 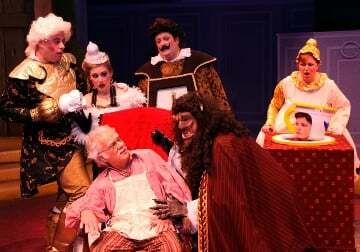 “Disney’s Beauty and the Beast” had eight public performances plus 12 weekday performances for schools in December 2013. The SCJ grant made it possible for more than 4,500 attendees of the weekday shows to pay less-than-half price for students and no fee for school staff. In collaboration with the Racine Unified School District, all seventh-graders are invited to spend a day at the RTG each spring. They go to workshops in acting, stage combat and makeup/special effects; see a performance, often joined by students from other grades and schools; and participate in a talkback with cast and crew. This year’s play is William Gibson’s dramatization of Helen Keller’s early life and amazing breakthrough with her teacher, Annie Sullivan. Public performances run April 4-13, and school presentations are on four weekdays. “It is our mission to offer programming that is enlightening, as well as entertaining,” said Beth Jurgaitis, Theatre Guild general manager.